No, really. When was the last time you and your loved ones talked about death? At a funeral, maybe? We aren't very good about discussing death, what we believe about it, what we want for our own funeral or the funeral of a loved one. Nope, it's too "icky" or scary or something. We don't want to discuss it. But we really need to. If you could plan three things for your funeral, what would they be? Visit a local cemetery. If you see an employee, ask them what it's like to work there. With a mother at the age of 88, and a dear friend who lost her husband at far too young an age, I've been talking about death and dying a lot lately. For our family, with our faith, it's a more natural discussion than for others. 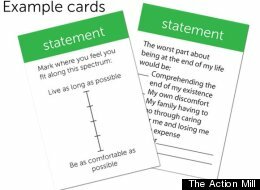 I think these cards are a great idea and can help a family (especially a family facing a loss) get more comfortable with discussing death. ...while the game's name may indicate a religious tilt, its creators say My Gift of Grace is also for nonreligious people. "We talk a lot about grace in our company. We have some people who say this is about religion. Our answer is that grace means different things to different people. It's having ease and comfortability," said Jehlen [another creator of the cards]. "Grace is associated with Christianity in some people's minds, but grace is also a part of a lot of other religions. We don't put explicitly religious questions into the cards, but people who are religious can express their faith while they play." You are most welcome! I hope your work helps many people figure out a way to discuss death, dying and living in a whole new, "un-scary" way. It's a terrific idea!